The party has written to Ceann Comhairle Seán Barrett over last week’s row at Leaders’ Questions. SINN FÉIN HAS written to the Ceann Comhairle Seán Barrett requesting that the Dáil’s disciplinary committee deal with its claim that the party’s TDs were the subject of defamatory allegations by Tánaiste Joan Burton last week. The comments were made during the course of a heated debate at Leaders’ Questions when the Tánaiste linked Sinn Féin to the cover-up of sexual abuse in the republican movement with Sinn Féin protestations leading to the Dáil being suspended three times in an hour. The party’s deputy leader, Mary Lou McDonald, had brought up new allegations about Gaeltacht teacher Domhnall Ó Lubhlaí —- who died in 2013 and who was accused of abusing dozens of victims in the 1970s and 1980s. In her response, Burton said Ó Lubhlaí had been connected to the republican movement. Referring to a previous Dáil debate on the Maíria Cahill controversy, Burton told the Dáil: “We heard in detail Sinn Féin describe the cover up of sexual abuse that happened on its watch in communities in the North of Ireland and with supporters in the Republic. In the letter, which you can read in full below, Sinn Féin says the Tánaiste was allowed to make defamatory statements about the party and that Barrett failed to request that Burton withdraw the marks. The party now wants the matter to be considered by the Dáil Committee on Procedures and Privileges (CPP) which is due to meet privately later today. It’s understood that the letter of complaint is not on the agenda for tonight’s meeting but will be considered next week. A spokesperson for the Ceann Comhairle confirmed that Ó Snodaigh’s letter has been referred to the CPP. I wish to record with you my dissatisfaction in how proceedings were chaired where political charges were made directly against the Sinn Féin party by An Tánaiste and Leader of the Labour Party Joan Burton, yet went unchallenged by you which I find totally unacceptable. 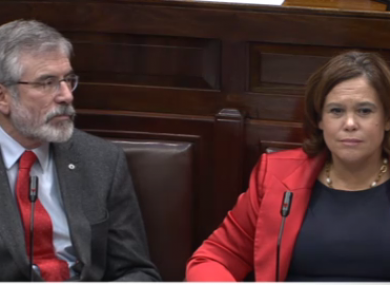 Deputy Mary Lou McDonald’s raised a valid question where she raised the scale of abuse perpetrated by the late Domhnall Ó Lubhlaí and asking would the Tánaiste join with her in calling on the Garda Commissioner and the Minister for Justice and Equality to instruct that all information required by Túsla be passed on without delay. She later repeated that assertion, that Sinn Féin were connected to a cover up of sexual abuse, making what I consider to be defamatory allegations without challenge by you. When then asked by Deputy McDonald for you to request that An Tánaiste withdraw her remarks, which in our view were defamatory in nature, you again failed to do so. In my view those Sinn Féin deputies present therefore had no choice but to challenge what was an abuse of privilege by An Tánaiste and Leader of the Labour Party Joan Burton. I am formally requesting that the Committee on Procedure and Privileges now consider this matter. Email “Sinn Féin has complained about 'defamatory allegations' from Joan Burton ”. Feedback on “Sinn Féin has complained about 'defamatory allegations' from Joan Burton ”.